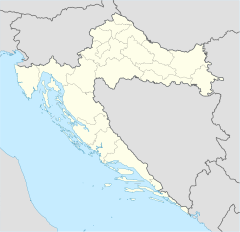 Oriovac is a village and municipality in Brod-Posavina County, Croatia. Its coordinates are 45°9′58″N 17°45′36″E﻿ / ﻿45.16611°N 17.76000°E﻿ / 45.16611; 17.76000. It has 6,559 inhabitants in 2001. Until 1918, Oriovac (named ORIOWACZ before 1850) was part of the Austrian monarchy (Kingdom of Croatia-Slavonia after the compromise of 1867), in the Slavonian Military Frontier, Gradiskaner Regiment N°VIII before its dissolution in 1881. "Population contingents, by towns/municipalities, Census 2001: County of Slavonski Brod-Posavina". Croatian Bureau of Statistics. Retrieved November 23, 2010. This page was last edited on 2 September 2018, at 22:01 (UTC).